First off was the Canmore training camp leading into Nationals. Canmore is a sweet place for training and just hanging out in general, if you haven’t been there check it out on your way to Banff. Amazing views, nice trails, tons of coffee shops and restaurants, and a few of my friends live there too. The track in Canmore is 300m and crushed gravel but it did the trick for me (we drove to Calgary for one track workout during our stay), I was able to find some speed that ended up helping me later on in the 5000m at Nationals. My first race on the track was the 10 000m on Wednesday (22nd) night. Due to the low numbers they combined the men’s and women’s race together, which was a good decision. The fields were the weakest they’ve ever been. And that’s not a knock against the people who ran, without us there wouldn’t be anyone, that’s a knock for all those who didn’t run. But I don’t blame anyone for not wanting to run a 10 000m in Calgary at 3400 feet. Why pay to fly across the country to race a slow time? I’m pretty sure the rest of the men’s field all live in Alberta and just drove to the race. Hoepfully we can host the 10 000m somewhere else next year and increase the participation. In the 10 my goal was to be the first Canadian and conserve as much as possible for the 5000m. I didn’t need to run as hard as I did but I didn’t feel as though I was running hard enough to hurt the 5000m. After running with Kip Kangogo for the first 24 laps I thought I may as well try and win the race outright. I picked up the pace with 400m to go and Kip surged by me shortly after. I gave chase for a few seconds then decided to conserve for the 5. Which was a good plan seeing as though I could have kicked much faster but probably would have still been second anyways. Here is a pic from the 10 000m. The 5000m was much more important to me because I was up against a couple of guys who have been running really well lately. I took the lead with 7 laps to go and kept throwing in surges to tire the others out. At the bell lap Kelly Wiebe drastically picked up the pace with 400m to go. I trailed him and thought this was going to be very tough but then with 300m to go the pace settled ever so slightly and I thought “ok, this is fine, just stay and here and crush the last 200m.” And then Ben Hubers flew around us with 250m to go and I thought “alright, this is the real move, go go go!” With 150m to go I went around Ben and thought I was going to pinch him off with a lapped runner but he was able to go inside while I was out in lane two. I had a step on him and I just put my head down and drilled home for my 5th 5000m title. Some people said my last lap was in 56 seconds but I think more like 58. Either way that’s the fastest 400m for me in the last four years. There were some awesome races at Nationals this year. Exciting men’s and women’s 1500m where it came down to the last 100m. Matt Hughes’ balls in the steeple and Alex’s finish were inspiring. But once again even though the races were tremendous the meet is so friggin’ boring! Women’s 800 was great, then you wait 5 minutes. Men’s 800, also cool, but then 5 minutes of waiting, in silence. Can you imagine going to a hockey game and in between plays just silence, no music? No wonder people aren’t flocking to watch our sport, 5 minutes between events!? At least introduce the competitors in detail during that time. A couple of pics from pre-nats below. 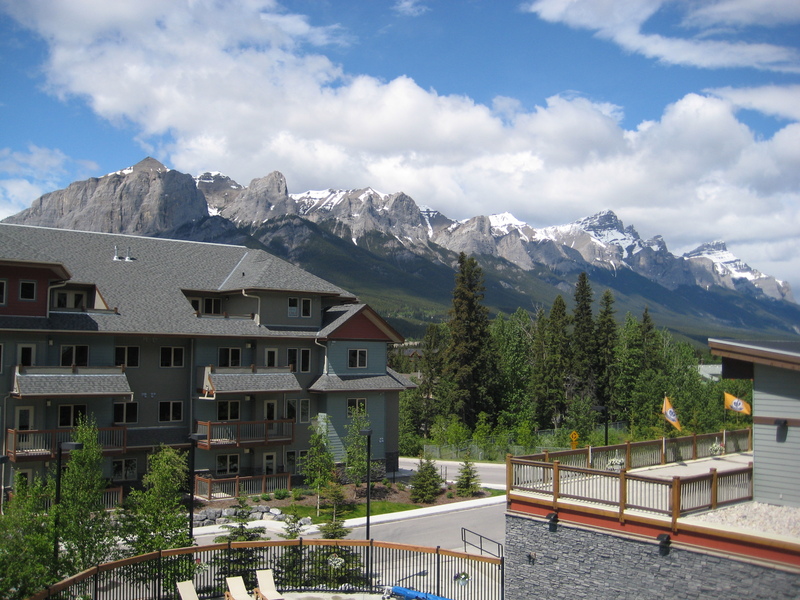 1) Getting ready for a trail run in Banff and 2) the view from our balcony in Canmore.